CAD CAM Linking Design with CNC Machining, AutoCAD Clone Design natively reads and writes AutoCAD DWG files, no need for conversion! progeCAM Professional offers machinists the choice of multi-axis milling, lathe or wire EDM. AutoLISP, VBA, ADS programming, import from PDF, Advanced Rendering, 3D ACIS Solid Modeling included. Windows 7 32,Windows 7 64, Import and edit your Raster Images, including Raster to Vector. Comes with near 11,000 standard symbols and blocks. 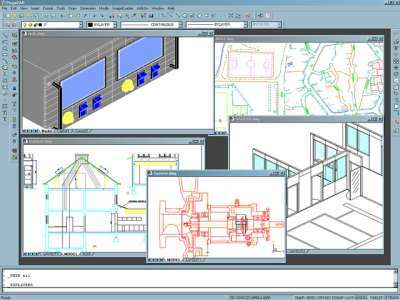 AutoCAD DWG File 2.5 - 2008 Open and Save Compatible with AutoCAD menus, scripts, fonts, etc. A Library of Blocks Symbols for Electrical Mechanical Architectural Civil Survey Hybrid DWG Raster Image Editing Vertical applications for many industries. Google Earth export, Quick Dimensioning, updated spell checker, DIESEL expression support, over 1000 new CAD symbols, right-mouse click context menus, improved speed and reliability, Advanced Data Extraction wizard, one-click text editing, an interactive purge command dialog, and one-click entity grouping, layout print area visualization. eTransmit, PDF, ECW, O2C, JPG, SVG XML image file support, Express Tools, easy-to-use attribute editing, DWG redlining, in place external reference editing, and Find and Replace text and attribute search, Network NLM, USB mobile, and corporate licensing options, over 300 new hatch patterns. progeCAM is ideal for for hobbyists, small job shops and schools. Suitable for table routers, gantry wood-working, table top milling and maintenance work. Machines include Milling and Drilling machines, Engraving machines, Routers, Laser and Plasma cutters. Comes with progeCAD Professional, an easy replacement for AutoCAD and AutoCAD LT!